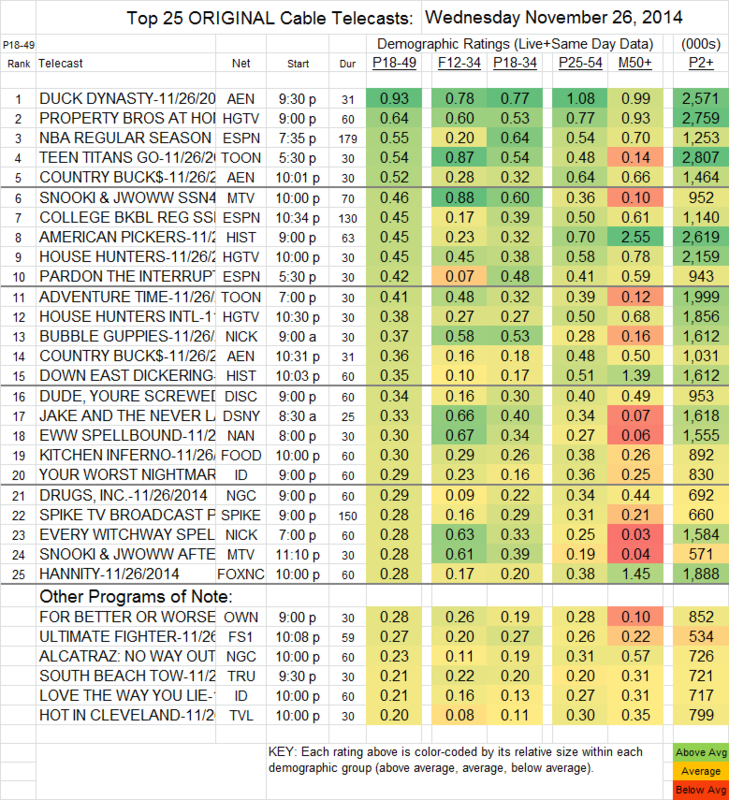 NETWORK UPDATE: A CHARLIE BROWN THANKSGIVING gained 0.1 in final numbers on Wednesday. There was no AMERICAN HORROR STORY on Thanksgiving Eve, which gave the nightly win to DUCK DYNASTY (A&E), down 0.05 to 0.93. Lead-out COUNTRY BUCK$ was at 0.52/0.36, down a steep 0.26/0.15 from last week. ESPN’s NBA game was at 0.55, about half of the previous Wednesday’s games, and it was followed by an NCAA BASKETBALL game at 0.45. On MTV, SNOOKI & JWOWW gained a tenth to 0.46, and an AFTER-SHOW was at 0.28. AMERICAN PICKERS (History) lost 0.12 to 0.45, as did lead-out DOWN EAST DICKERING at 0.35. FOR BETTER OR WORSE (OWN) was steady, up 0.01 to 0.28. HOT IN CLEVELAND (TVLand) was at 0.20.